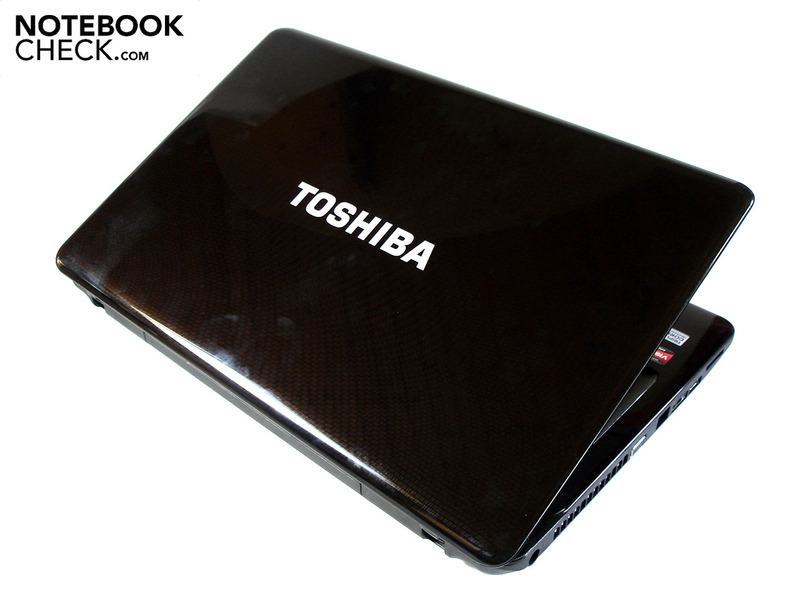 Like a Satellite... With the Satellite L670D-120, Toshiba is offering an amazing amount of value for the money. For a suggested price of under 1000 Euro, buyers receive not only a triple-core CPU from AMD and a middle-class graphics card from ATI, but also a Blu-Ray burner as well. Read on to find out whether the offer is worth the price. So that potential buyers aren't completely overwhelmed by the flood of Satellite L670D-models currently on the market, we have categorized the five available models and sorted through their data for your benefit. The least-expensive entry-level model, the L670D-103, is available for around 550 Euro (MSRP 650 €) and is outfitted with an AMD Athlon II P320 (2x 2.10 GHz, 1MB L2-cache), a weak ATI Radeon HD 4250 and hard drive capacity amounting to 320 GB. Following this is the L670D-105, increasing the base price to 600 Euro (MSRP 750 €). 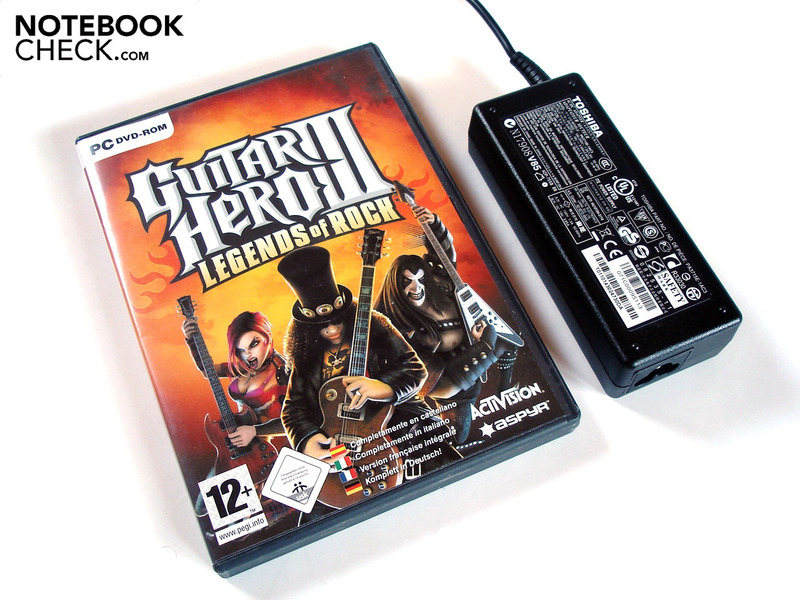 Though the processor remains identical the hard drive capacity grows to 500 GB and the graphics card is replaced by a substantially more powerful Radeon HD 5145. The two following models, the L670D-106 and L670D-11T, are available for around 700 Euro which makes them a bit heftier on the wallet, though the features gained are substantial. While the L670D-106's (MSRP 799 €) 500 GB hard drive and Radeon HD 5650 make it more performance oriented, the L670D-11T (MSRP 849 €) has a 320 GB hard drive, Radeon HD 5145 and a Blu-Ray burner, making it more entertainment-friendly. Common to both models is the AMD Turion II P250 (2x 2.30 GHz, 2 MB L2 cache) processor. We then come to the top of the Toshiba pyramid, to the 800 Euro L670D-120 variant (MSRP 949 €) which essentially takes all the strengths of the previous models and wraps them all up: it features a Blu-Ray burner, a 500 GB HDD and a Radeon HD 5650. On the processor front is a triple-core AMD model, the Phenom II P820 (3x 1.80 GHz, 1.5 MB L2-cache). Regardless of variant, all systems come with Windows 7 Home Premium 64-bit pre-installed. Also on tap are 4 GB of DDR3-RAM and a 17.3-inch display with a native resolution of 1600 x 900 pixels. Our recommendation: Budget-minded folks would do well to give the L670D-105 a look and those looking for a good price/performance ratio should consider the L670D-106. Lastly, for those that absolutely need a Blu-Ray burner, the L670D-120 is best up to the task. 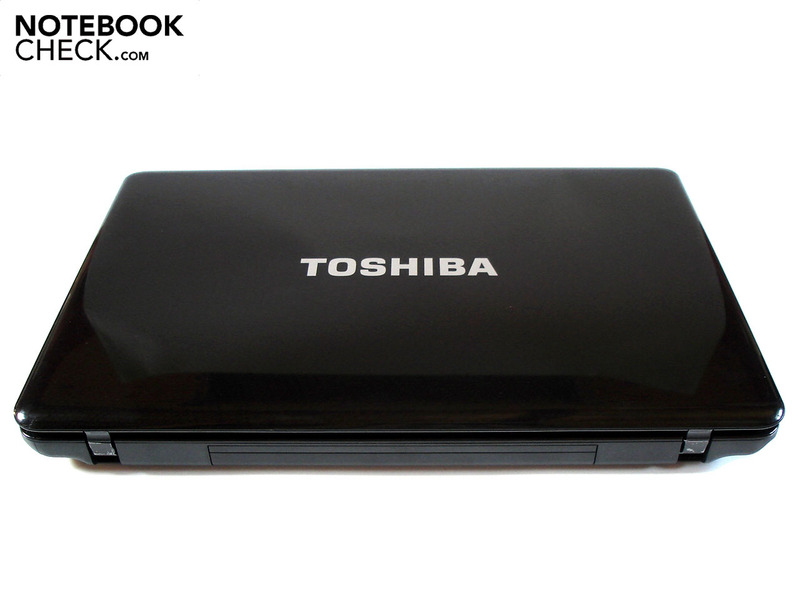 Toshiba is well-known for its use of rakish, high-gloss surfaces on its notebooks. 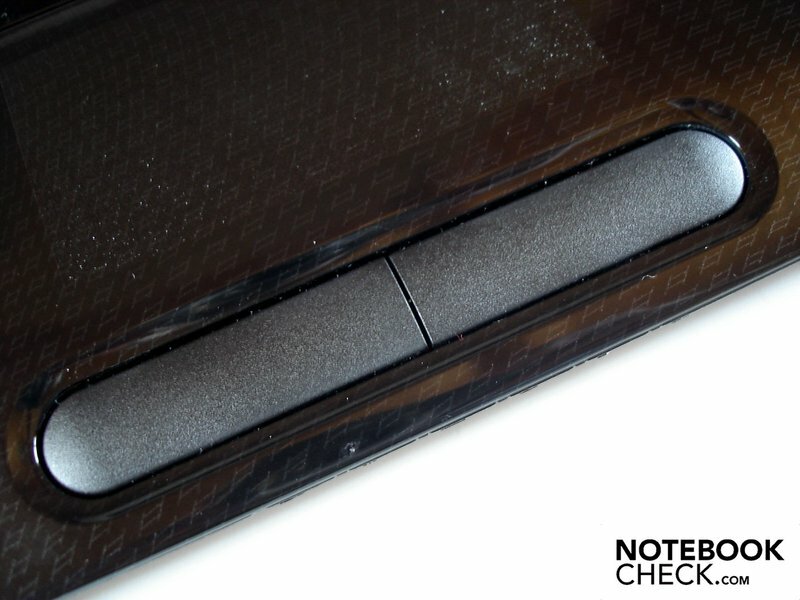 In this sense, things have changed very little, as both the display lid and upper surface of the notebook are made of black plastic coated in a piano-lacquer finish. While this gives the Satellite L670D-120 a very high-grade look from afar, as one gets closer the extreme sensitivity of the surfaces are quite apparent to the eye. 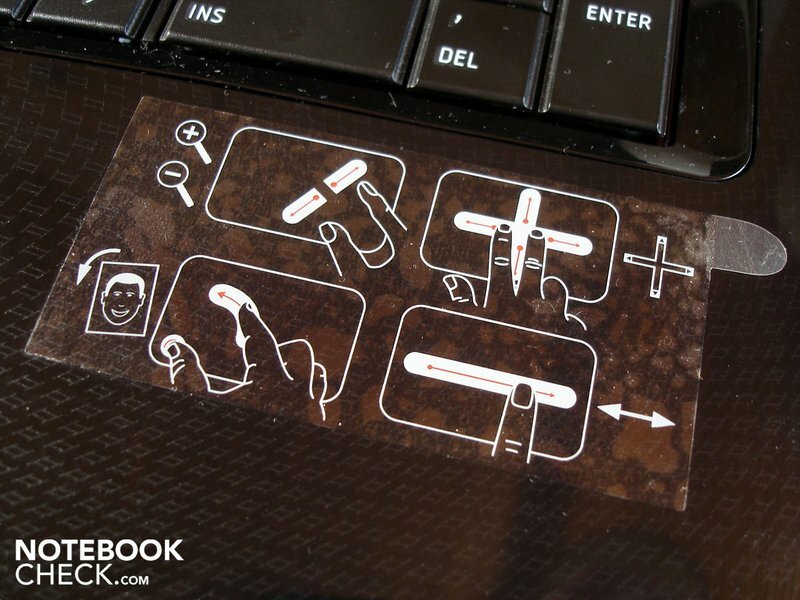 Even when handling the notebook carefully, dust and fingerprints are sure to quickly collect on the upper surfaces. Despite this, we found the overall design was well done. 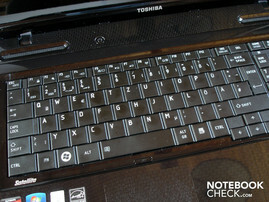 This then brings us next to the theme of stability, of which the Toshiba has little. The outer lid showed strong evidence of being able to be bent and deformed under pressure. 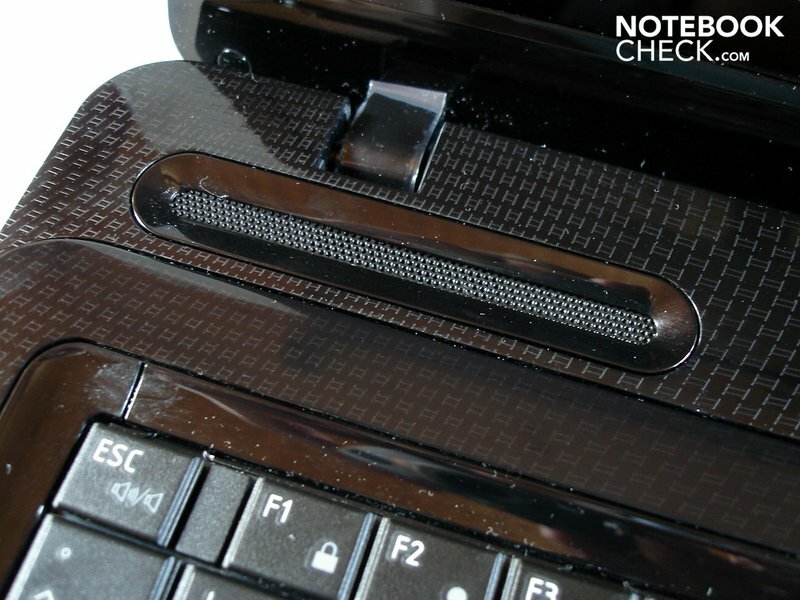 The keyboard as well as the area around it (specifically near the numeric pad) also fell victim to this problem; only the underside of the notebook remained mostly stable. However, it must be said that the majority of notebooks do not fare well in this test either. 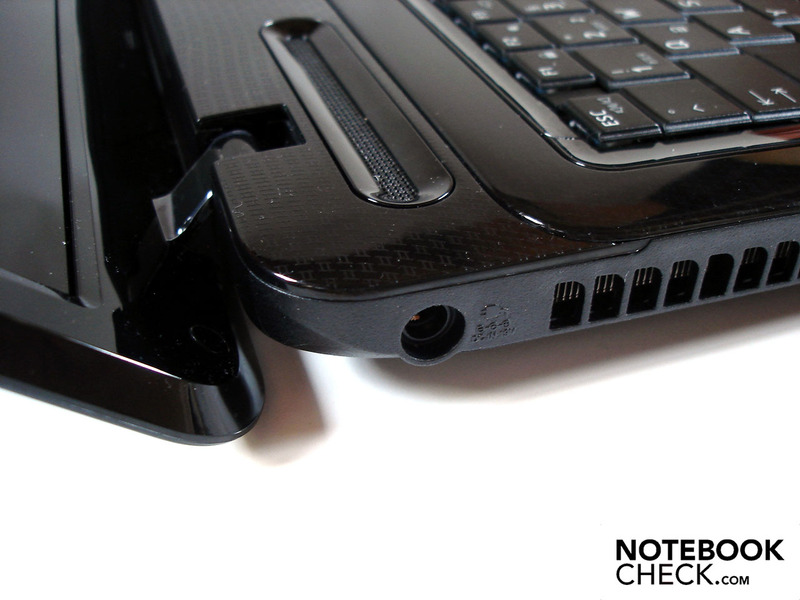 Furthermore, the hinges allow a bit of wobble to occur when the notebook is opened. 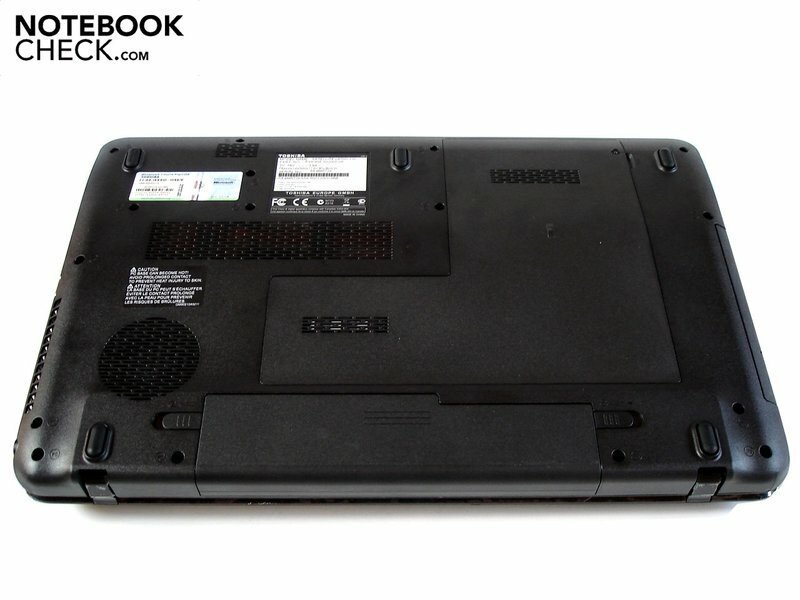 With a size of 414 x 270 x 40 mm (width x depth x height) the Satellite L670D-120 is not what you would call compact, the weight of 2.8 kilograms is comparably light for a 17-inch notebook which lends it a certain measure of portability. 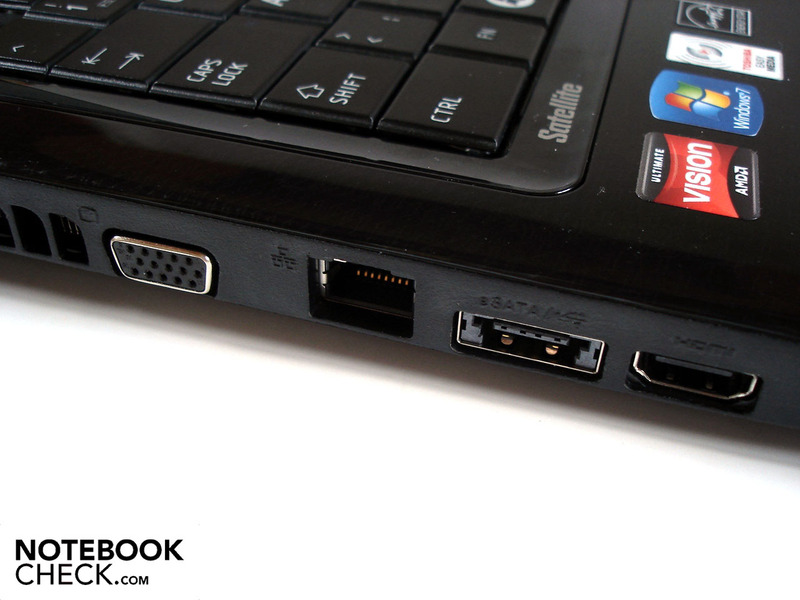 The available connectivity is good overall, though the missing ExpressCard and Firewire ports may leave some users feeling a little disappointed. The left side is home to two video-out ports, a VGA and HDMI, which make it possible to connect external monitors to the device. Two USB 2.0 ports (right) as well as an eSATA/ USB 2.0 combo (left) are further points of interest and are useful for peripheral connection (mouse, keyboard, etc.) or storage mediums (USB stick, hard drives). With the help of the integrated card reader, photos and data from digital cameras and cell phones can be uploaded with ease. 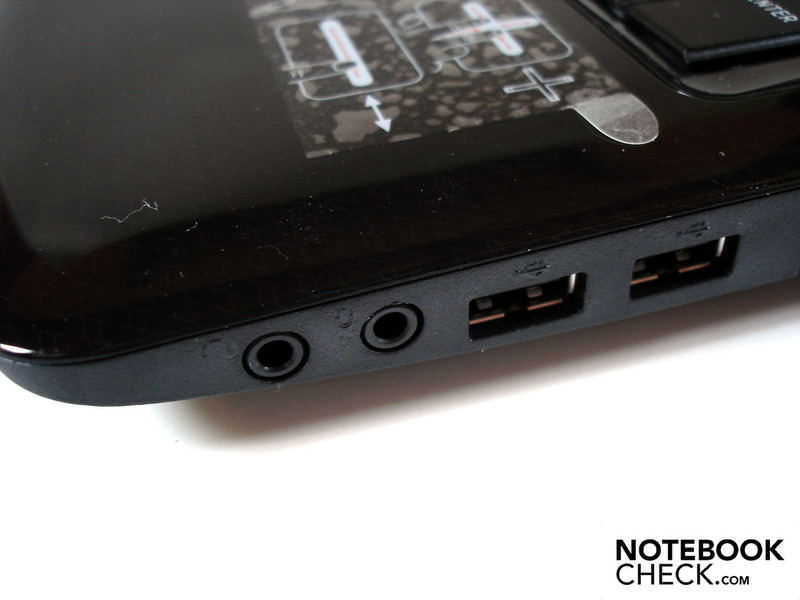 Those who wish to connect a headset or stereo will be pleased with an audio in/out jack. Rounding out the package is a Kensington lock and an RJ-45 fast Ethernet connection good for up to 100 MB/s. 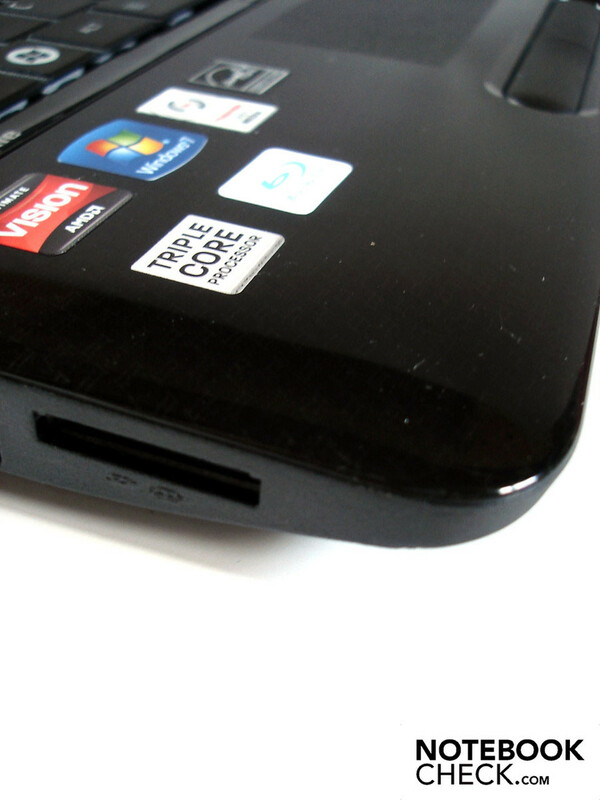 The inconvenient positioning of the ports is a problem for both left- and right-handed users. As the majority of the ports are located at the front of their respective sides, connecting cables to the ports quickly limits the space available to operate a mouse or other external peripheral. 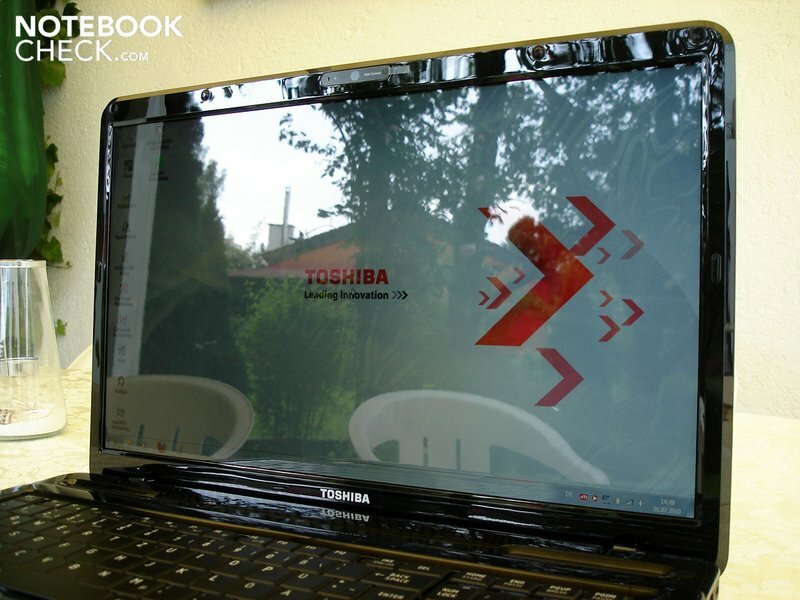 Toshiba understands like no other what it means to drown a notebook in software. As the screenshot on the right side proves, more than 20 programs have "Toshiba" in their name, the majority of which are nothing more than shovelware--the word that comes to mind here is "redundant". The negative consequences are apparent: first, all of these programs increase the start- and reaction time of the operating system and secondly, many of them nest themselves in the taskbar and serve to get on one's nerves with updates and messages. The solution to all this is simple if time-consuming: open the control panel and deinstall everything that, after a trial or online research, is either useless or unnecessary. At the very least Corel WinDVD BD should be left, as the program is able to play back Blu-Ray discs among other things. Without the appropriate software, little can be done with the integrated Blu-Ray drive, making the purchase of expensive software necessary to watch movies. In the packing carton one can find the 75 Watt AC adapter as well as a comprehensive handbook--apart from these, there is nothing else included. The free-standing keys possess on the one hand impeccable sizing and on the other the keystroke is undefined. Users typing with this keyboard will, with the exception of the acceptable acoustics, receive an unacceptable feedback: the typing response is relatively spongy. The layout of the matte keys is orderly, though the necessity of using the Fn key (additionally) when entering a print command was not to our liking. 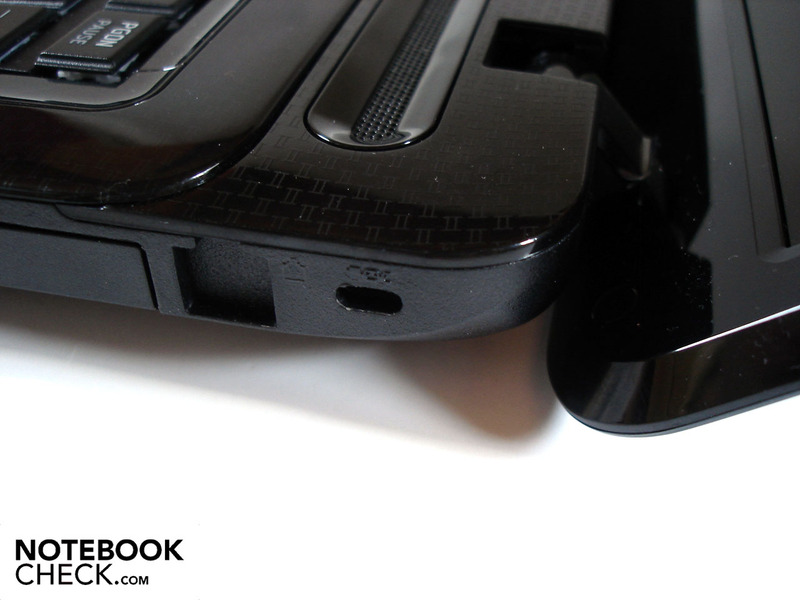 The touchpad left us with a two-fold impression. The lightly textured surface provides sufficient ease of gliding, but, the orientation of the pad optically and haptically is suboptimal, as the touchpad is neither sunk in nor differentiated in color from the palm rest. The precision of the pad is not without fault, as the four centimeter size of the pad makes readjustment of one's fingers often necessary. 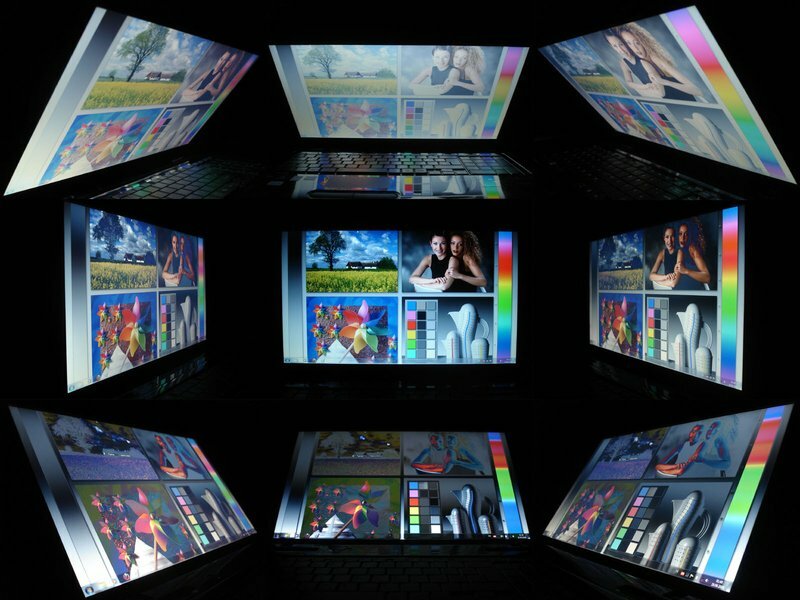 The supported multi-touch function is mostly solid and transparent in operation. The two abnormally large mouse buttons functionally work as expected, though the loud and clacking sound that they emit in operation certainly smacks of cheapness. Toshiba put a 17.3-inch display to work in the Satellite L670D-120, which displays in 16:9 format and is equipped with an LED-back-light. The resolution of 1600 x 900 we feel was intelligently chosen, as one can work problem-free in two windows simultaneously while at the same time not overwhelming the graphics card. 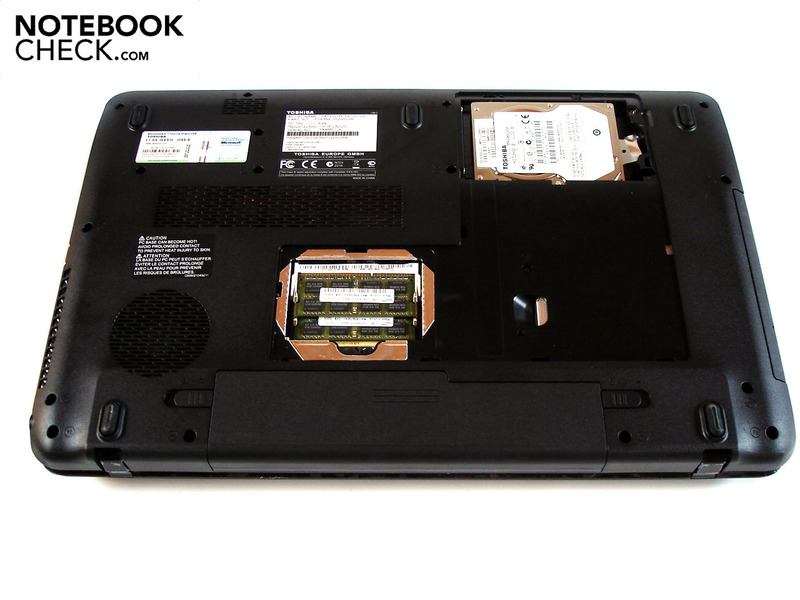 The type LP173WD1-TLA1 panel unfortunately is only of average quality, as is the custom with most notebooks. On the positive side is a brightness value measures at 204.6 cd/m². 189 cd/m² was the darkest recorded and 214 cd/m² was the brightest result that the display could muster, giving it a good illumination score of 88%. On the negative side a low contrast of 204:1 as well as a high black value of 1.04cd/m²: measuring color fastness and intensity the panel here draws a short straw when compared to a good external TFT display. The Satellite L670D-120 is hardly suitable for outdoor use, as the reflective display surface leads to strong reflections when in the presence of moderate light sources. Even indoors, one is never quite free of annoying reflections especially when positioning the notebook in an unfavorable manner. A matte surface would have done wonders here, though the colors would appear a little more bland and the film- and gaming-enjoyment lessen to a certain extent. Lastly we come to viewing angles, which on the horizontal axis are certainly tolerable. On the vertical, the smallest deviation from the ideal position is enough to falsify the picture and certain areas of the display have a tendency to drift into gray tones, which is particularly distracting when watching a film. 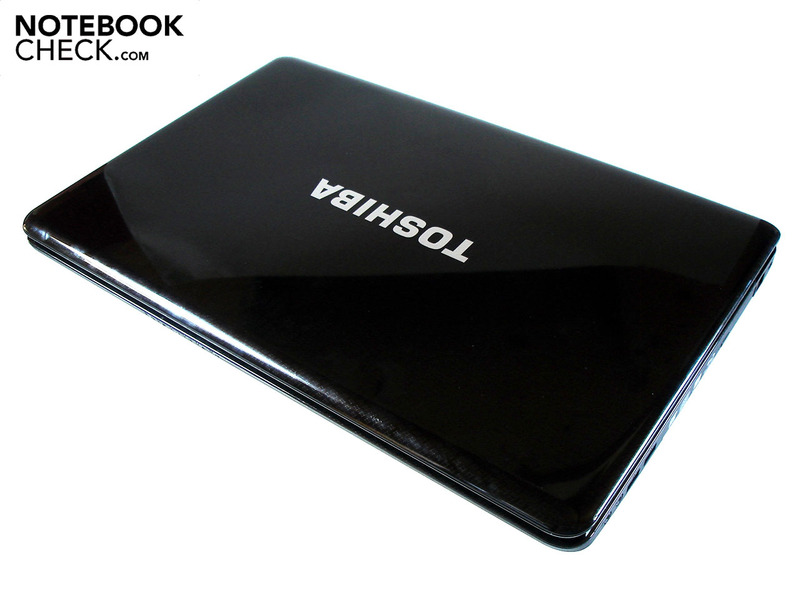 The Phenom II X3 processor used in the Toshiba marks the first time that a triple-core CPU has been used in a notebook. 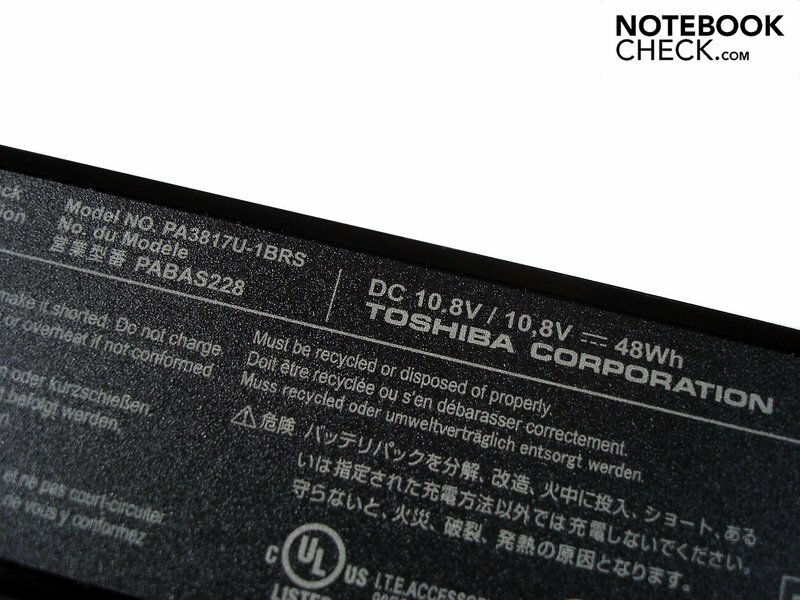 Toshiba decided on the P820, which has a low energy use of only 25 Watts TDP. For comparison: Intel's quad-core processors from the current Core i-range use between 45 and 55 Watts. The stock frequency of 1.80 GHz is in the same ballpark as that of the Core i7 CPU, which range from 1.60 to 2.13 GHz. That said, the Phenom II X3 must make do without the practical Turbo-Boost feature of Intel's processors; under load the processor cores here will not be automatically overclocked to preset values. Even in multi-core applications AMD one again bows to Intel for not including technology like Hyperthreading, which simulated virtual cores to match physical ones present. The largest problem with the Phenom II X3 P820 is the extremely small L2-cache. On graphics duty is the quite successful and equally convincing Mobility Radeon HD 5650 from ATI, which has an excellent price/performance ratio. The middle-class GPU, fabricated on a 40nm process is the successor to the much-liked Radeon HD 4650 and possesses not only 627 million transistors but also DirectX 11 support. The video memory (800 MHz), at 1024 MB is large enough since the 128-bit memory interface is rather small and the Radeon HD 5650 can only profit from so much memory to a certain extent. In combination with the installed DDR3-VRAM the small 128-bit bandwidth of the video memory quickly becomes the limiting factor, especially playing games at high resolutions. One also has to give a hand to the Radeon HD 5650 for keeping energy consumption at a moderate level of 15-19 Watts. With respect to the graphics, only one detail of the Satellite L670D-120 has left us wanting: in comparison to other notebooks with the Radeon HD 5650, the one here is under-clocked from 550 MHz to 450 MHz. In order to better approximate the performance of the processor, we have turned to the 64-bit version of Cinebench R10 as per usual. Up on stage for the test are the Phenom II X3 P820 as well as the entry-level dual-core Core i3-330M (2x 2.13 GHz) as well as the often used quad-core Core i7-720QM (4x 1.60 GHz). In the single-core rendering test the P820, with 1965 points, scores below the i3-330M with 2756 points--the advantage here is due to the higher frequency of Intel's offering. The i7-720QM, with a little help from its Turbo-Mode feature, is able to rank a bit higher at 3706, making it the top of the crop. The same picture can be found in the multi-core rendering test where the i7-720QM (9947 points) and the i3-330M (6546 points) blow right past the P820 (5216 points) thanks to the advantages of Hyperthreading and its simulated cores. In 3DMark 06 (CPU score) the i7-720QM (3087 points) and the P820 (2056 points) are still a world apart, though the distance to the i3-330M (2203 points) is noteworthy. Now let us turn to the graphics benchmarks. Starting with 3DMark 06, the Phenom II X3 P820 combined with the Radeon HD 5650 manages a passable point total of 5874. A higher-clocked HD 5650 in conjunction with a Core i3-330M (Acer Aspire 8942G-334G64Mn) lies about 11% to the north with 6540 points. A combination of Core i3-330M and the graphics competition from Nvidia's sector, the GeForce GT 330M (Sony Vaio VPC-CW2S1E/L) lies further down the totem pole at 5382 points. In 3DMark Vantage the difference is larger and the Radeon HD 5650 (2823 points) is able to distance itself 29% from the GeForce GT 330M (2192 points). Against the Aspire 8942G-334G64Mn the Satellite L670D-120 doesn't stand a chance, since 3150 points puts the Acer at a performance level 12% higher. 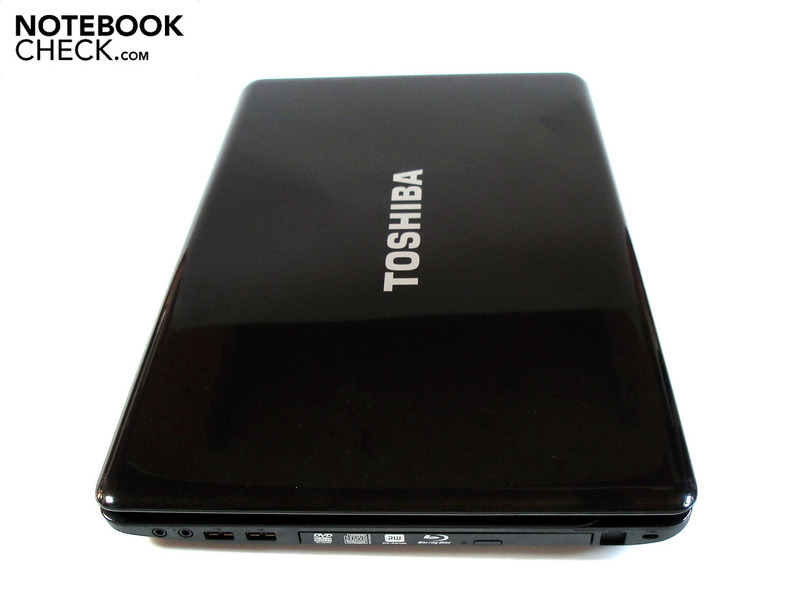 In order to have sufficient storage space on tap, a 500 GB hard drive from Toshiba is standard (Toshiba MK5065GSX). 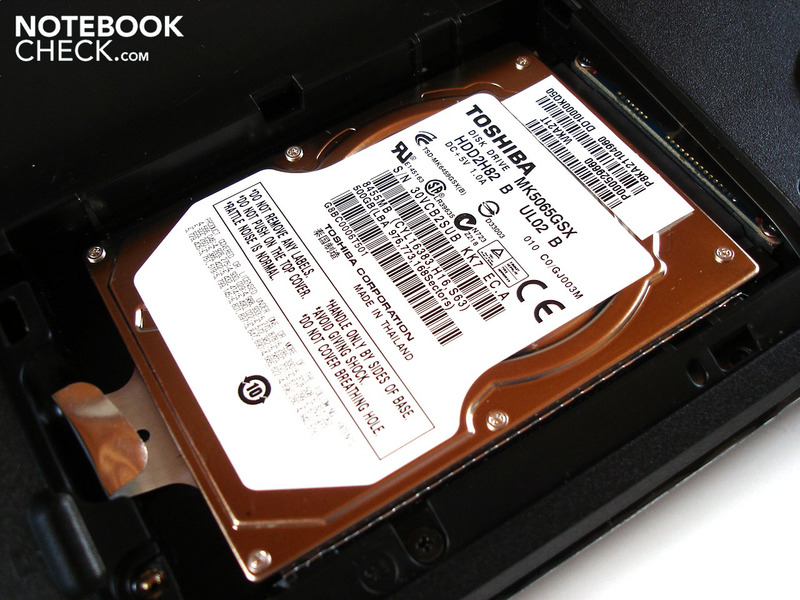 The hard drive is of the 5400 rpm variety and can transmit at an average of 65.7 MB/sec. The access time (16.9 ms) is not in any way conspicuous and lies within normal ranges. Toshiba has partitioned the drive into two sectors, surely a question of taste. Both partitions measure 232 GB and are just waiting to be filled to the brim with data. Although the Phenom II X3 isn't comparable to other processors from Intel, the application performance of the Satellite L670D-120 is generally good. The power on tap is, for the average user, more than sufficient for internet, films and other activities. 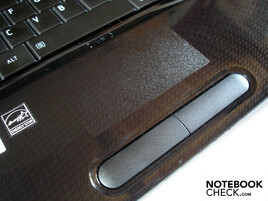 For the gaming benchmarks we used two other notebooks for comparative purposes. The first of two is the Sony Vaio VPC-EB1S1E/BJ, featuring a Core i5-430M and a Radeon HD 5650 clocked at 450 MHz. The idea here is to find out how the Phenom II X3 P820 fares against other processors under similar conditions. 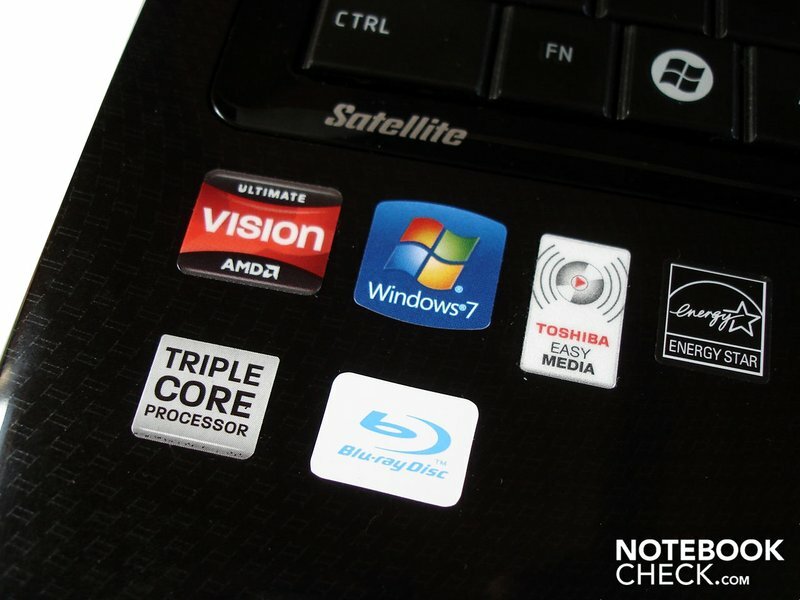 The second notebook that we are using is the Acer Aspire 4820TG-434G64Mn, which we were interested in because the built in Radeon HD 5650 is clocked at a higher frequency than the other two. At a resolution of 1366 x 768, high details (all on) and 4x AA activated, the Satellite L670D-120 is able to put up 33.2 fps which is a wholly usable frame rate. The Vaio VPC-EB1S1E is just as fast with 33.6 fps and the Aspire 4820G-434G64Mn is able to manage a 14% increase to 37.9 fps, distancing itself from the competition. In comparison to Modern Warfare 2, the Satellite L670D-120 is completely overwhelmed in Bad Company 2 at high details. At 4xAF and a resolution of 1366 x 768 only 25.9 fps was possible. The Vaio VPC-EB1S1E is just as well off at 25.1 fps while the Aspire 4820TG-434G64Mn is 8% faster at 28.1 fps. Those not particularly bothered by periodic nose dives in the frame rate will be happy to know that Shift was playable at 1366x 768 with 4xAA and high details on to the tune of 28.1 fps. The Aspire 4820TG-434G64Mn crosses the finish line a hair faster at 29.9 fps (+6%) and the Vaio VPC-EB1S1E stumbles a step backwards to 26.5 fps. Third-person role playing games played from a third-person perspective are usually able to be played at frame rates a bit lower than what would be possible in other games, but 20.1 fps at 1366 x 768, high details and 4x AF is just too little. The Vaio VPC-EB1S1E manages 0.1 fps more than the Satellite; the Aspire 4820TG-434G64Mn is equally worse off at 22.6 fps though it is 12% more fluid in its effort. The strategy title centered around building replays at a smooth 25.2 fps at a resolution of 1280 x 1024 and very high details/ 4x AF turned on. Having said this, the epileptic frame rate when zooming in at various degrees quickly gets on one's nerves. As Anno 1404 is very accommodating to multiple cores, the Vaio VPC-EB1S1E is beat out with its score of 23.7 fps. Gamers wishing to play Metro 2033 at high resolutions and with extreme details will have to seek out an extremely performance-oriented notebook to call their own. 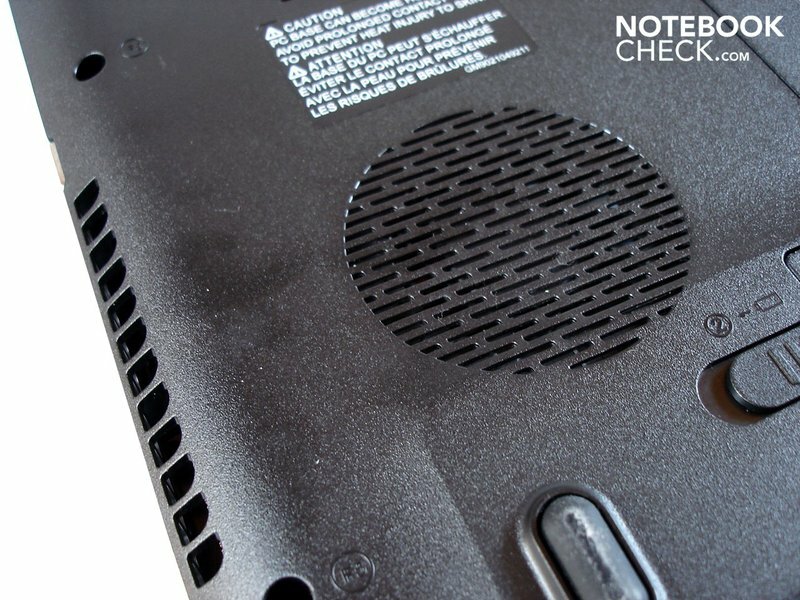 The Satellite L670D-120 is not one of these notebooks: details set to middle, DirectX 10 mode on and a resolution of 1366 x 768 handicap the notebook right off the bat to 22.7 fps. The Aspire 4820TG-434G64Mn is mostly playable at 26.4 fps (+16%) though such a frame rate isn't quite to Metro 2033's liking. As Anno 1404 before it, Dirt 2 is very receptive to three or four actual CPU cores. The Satellite L670D-120 pulls its weight here with 25.9 fps when set to 1366 x 768, high details and 4xAA as does the Vaio VPC-EB1S1E (22.4 fps) and the Aspire 4820TG-434G64Mn (24.9 fps). For a rounded experience, setting details to mid-level will ensure that the frame rate flows like water. Mid-level details, naturally: the title, almost three years old, still does not have any trouble at all stressing out hardware to its maximum. Due to this, high or very high details are usually out of the question. At a resolution of 1024 x 768 we were only able to squeeze a meager 25.1 fps out of the hardware. The Vaio VPC-EB1S1E is a short step behind at 23.7 fps. Though AMD's Phenom II X3 P820 put on a relatively disappointing show in the application benchmarks, the triple-core was able to pose a sure fire threat in the gaming tests against Intel's offerings with Hyperthreading. The Satellite L670D-120 with an average of 26.2 to 25 fps (high detail) is just a smidgen above the Sony Vaio VPC-EB1S1E/BJ containing the same graphics card but armed with a Core i5-430M processor. 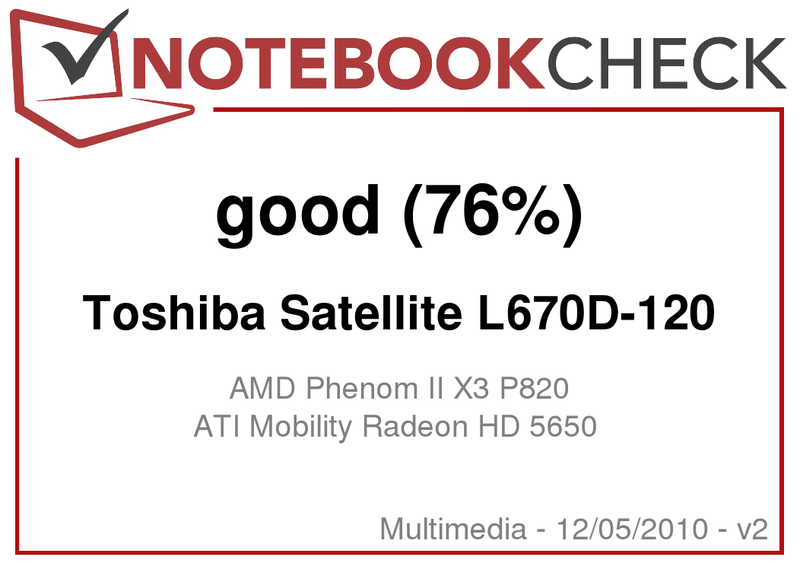 Against a notebook with a high clocked Radeon HD 5650 like the Acer Aspire 4820TG-434G64Mn, the Satellite L670D-120 isn't as well-equipped: a 9% performance gain can be seen. The Radeon HD 5650, then, is overall a good choice for gamers who do not wish to spend more than 1000 Euro on a notebook and are ready to reduce the detail and resolutions to accommodate certain titles. Demanding gamers should look a step above to the upper-class graphics cards like the Radeon HD 5850 or HD 5870 (each with GDDR5-VRAM) and the GeForce GTX 280M, GTX 285M or GTX 480M from Nvidia. The noise profile is certainly in order: if the Satellite L670D-120 is lightly stressed (Office, Internet, etc.) 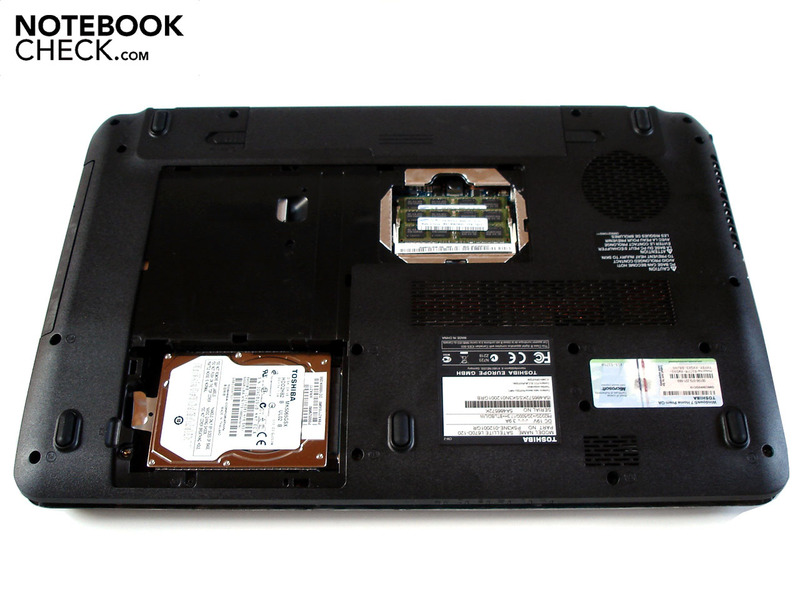 the cooling fan only turns quietly while the hard drive whirs away with audible clicking. 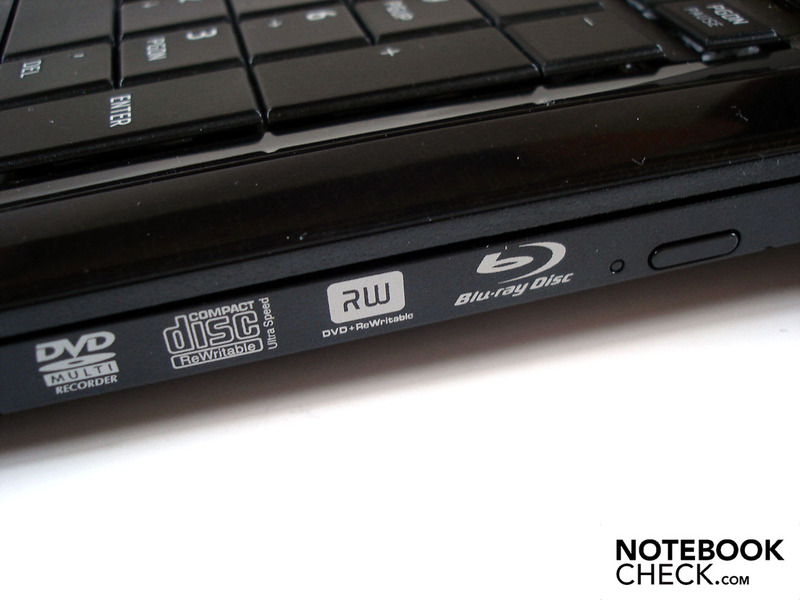 When playing back a DVD/Blu-Ray the noise is again acceptable (films are not drowned out by the noise) and only when accessing data is the optical drive audible. 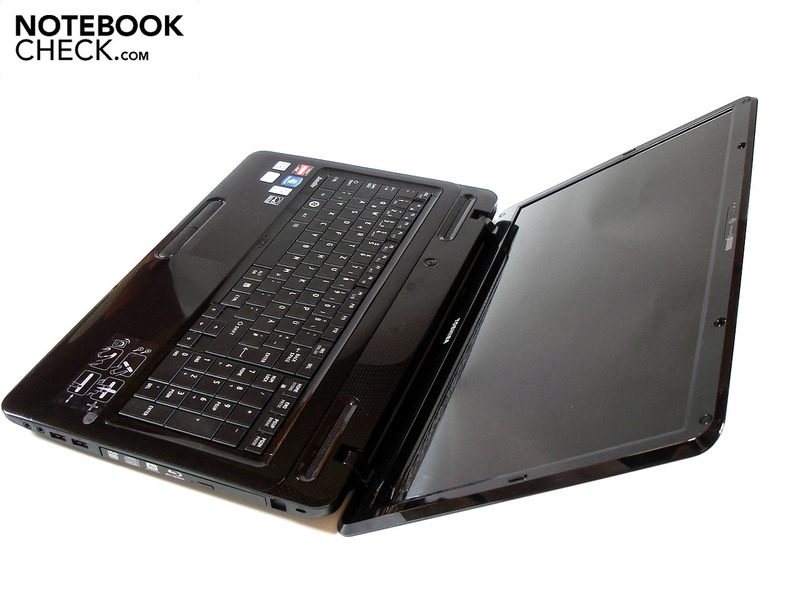 The same can be said for operation under stress: while playing games the cooling system is hardly audible, though the notebook is relatively loud under full stress. At idle the CPU and GPU are within acceptable boundaries around 44°C. After many hours of stressing the notebook with Furmark and Prime the Phenom II X3 reaches a peak temperature of 77°C. The Radeon HD 5650 under similar circumstances reaches 85°C which is a high but not alarming temperature. The temperatures of the chassis surfaces are very good when at idle: the underside of the Satellite L670D-120 reaches a maximum of 31.6°C, making operation on one's lap quite possible. The area surrounding the palm rest, at 29.2°C, is also quite cool. Under stress the left side of the keyboard heats up (up to 36.6°C) and the palm rest warms to an especially noticeable 34.5°C. 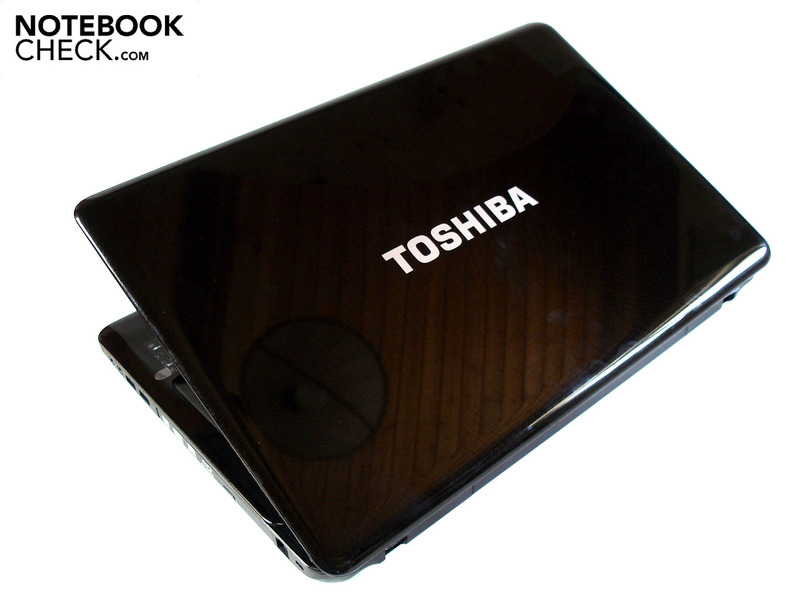 Toshiba gave the Satellite L670D-120 two speakers which, typical of notebooks, have an average sound image. The sound is powerless, artificial and tinny when compared to a "full-grown" stereo and the highs are frayed at loud volumes. When the Audio Enhancer Function is activated the maximum volume increases and the speakers are further at the mercy of their spongy sound. Despite this, we recommend activating the Audio Enhancer Function. As the Phenom II X3 does not possess an integrated graphics chip, the satellite L670D-120 has to do without an option for "switchable graphics". In combination with the weak battery (48 Wh) nothing but poor battery life can be expected. Even when under low stress (Readers Test from Battery Eater) the notebook is not able to make it to the three hour mark when the brightness is set to minimal and the energy-saving options are set to maximum. When surfing via WLAN and with energy-options set to moderate and brightness set to maximum only two hours are possible. Enjoyment of films while on the go is also cut drastically short, as only around 1.5 hours are possible on a single charge, which is simply too little to make it to the end of an average film. Under stress (Classic Test from Battery Eater), the Satellite L670D-120 lasts only an hour when energy saving options are deactivated. 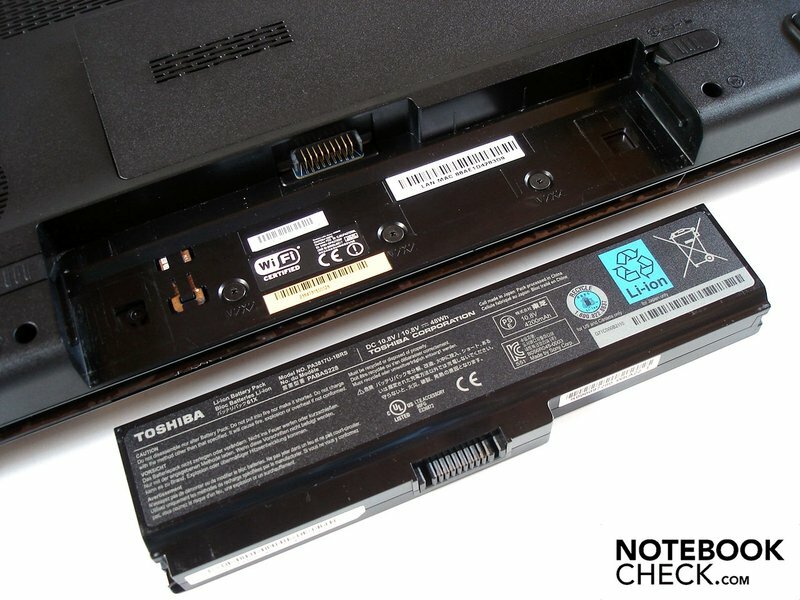 Other multimedia notebooks like the Acer Aspire 7745G-434G50Bn show how battery life can be done properly on a capable machine. 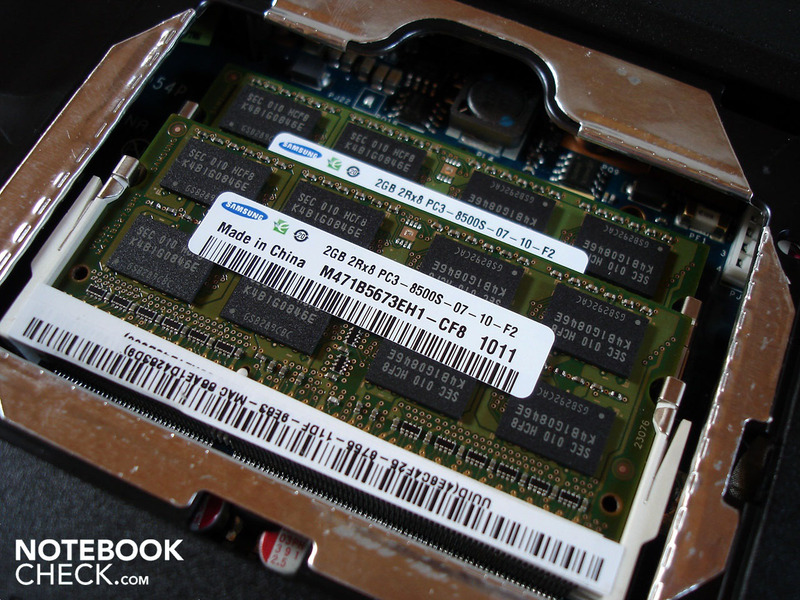 The energy consumption of the notebook at idle is a bit higher than comparable notebooks (see the Samsung NP-R780-JS03DE, for example) with 20.5 - 28.0 Watts of draw. Under stress the Satellite L670D-120 draws less energy than normal with 49.3 - 62.2 Watts. All in all, the Satellite L670D-120 left a good impression upon us. The craftsmanship is without peer, the input devices are in order and the temperature and noise profiles are certainly likable. Above all, we fancied the excellent price/performance ratio: for around 800 Euro (street price), the buyer receives not only a Blu-Ray burner but also a triple-core processor and a graphics card from the upper middle class. Both entertainment fans and gamers alike will find something to love. Yet, the Satellite L670D-120 is not free from flaws. Starting with the abysmal battery life and moving on to the limited and poorly-positioned connectivity ports and extremely sensitive chassis surfaces we come lastly to the display which could use an upgrade in the contrast, black value and vertical viewing angle departments. However: those looking for a chic and performance-capable multimedia notebook in a 17-inch format, look no more--the Satellite L670D-120 is your machine. From the back to the front the Satellite L670D-120 just gets thinner. 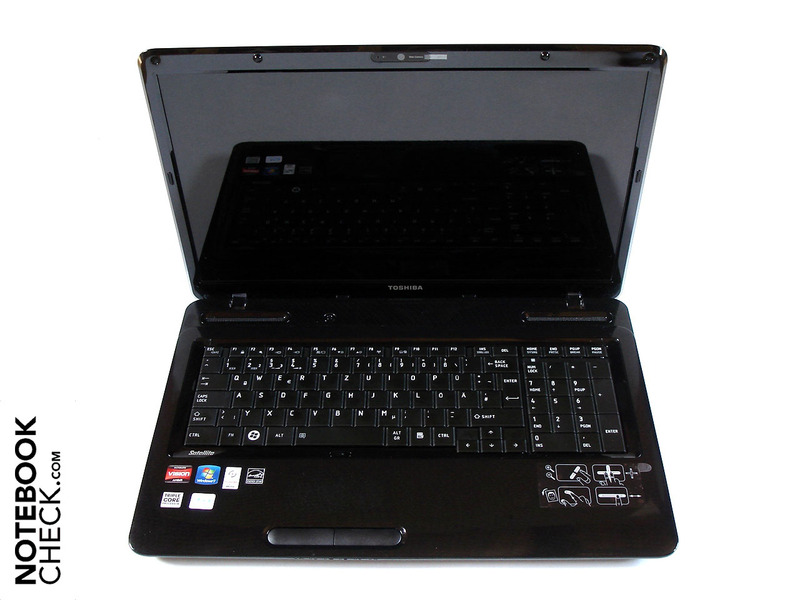 For a price around 800 Euro the Satellite L670D-120 is well-equipped with features. The always-present fan is located on the left side. The two speakers provide decent sound. Many surfaces have a novel texture to them. 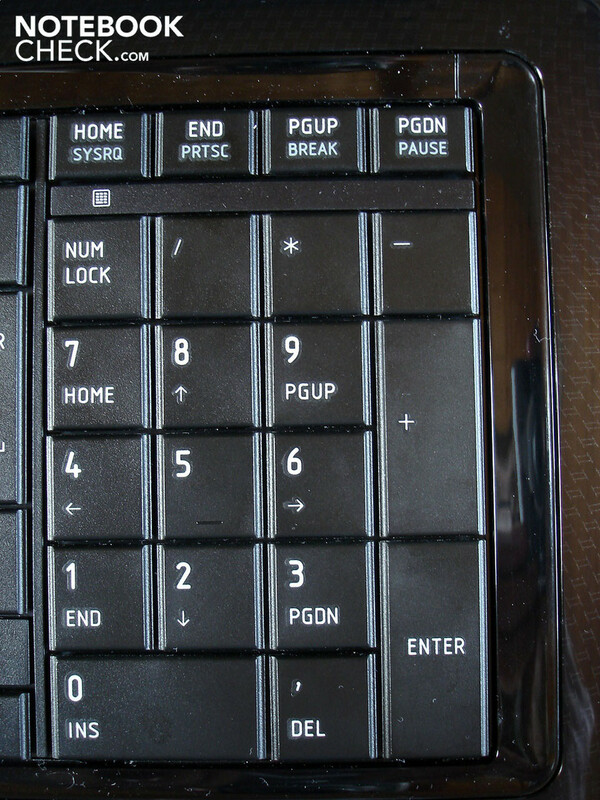 A numeric keypad is a must on a 17-inch notebook. 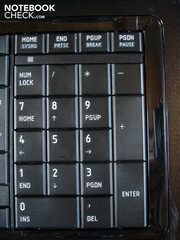 The touch pad is programmed to respond to various gestures. The two touch pad buttons are very wide. 2x sound and 2x USB 2.0 are on the right hand side. A Blu-Ray burner is certainly the icing on the Satellite L670D-120's cake. The RJ-11 modem connection is not usable. Power connector can be found on the left side. VGA, RJ-45 Fast-Ethernet-Lan, eSATA/USB 2.0 and HDMI are a tight fit. A single fan is responsible for the waste component heat. Five chassis feet mean that everything stays put. One can see their surroundings in the high-gloss surfaces. The maximum display angle is more than sufficient. 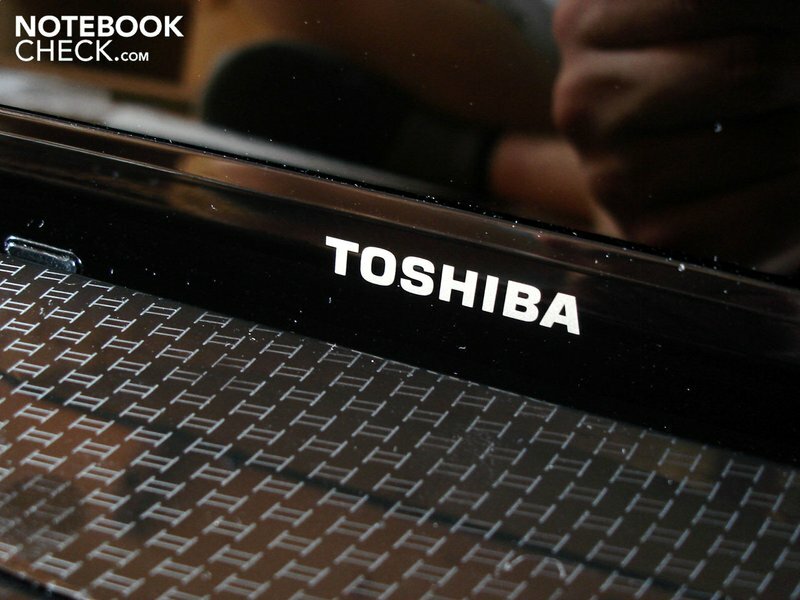 The Toshiba-logo crosses the outer lid. A question of taste: dark color tones dominate. When opening, the base unit is likely to come along for the ride. We found the design to be well-done through and through. A large plate can be removed from the underside of the chassis. Only the RAM and hard drive are accessible. The battery, with 48Wh, is downright weak. 2x 2048 MB DDR3-RAM are installed. The hard drive (5400 rpm) has capacity of 500 GB. The battery can be found at the back to the right. The 75 Watt AC adapter is quite dainty. 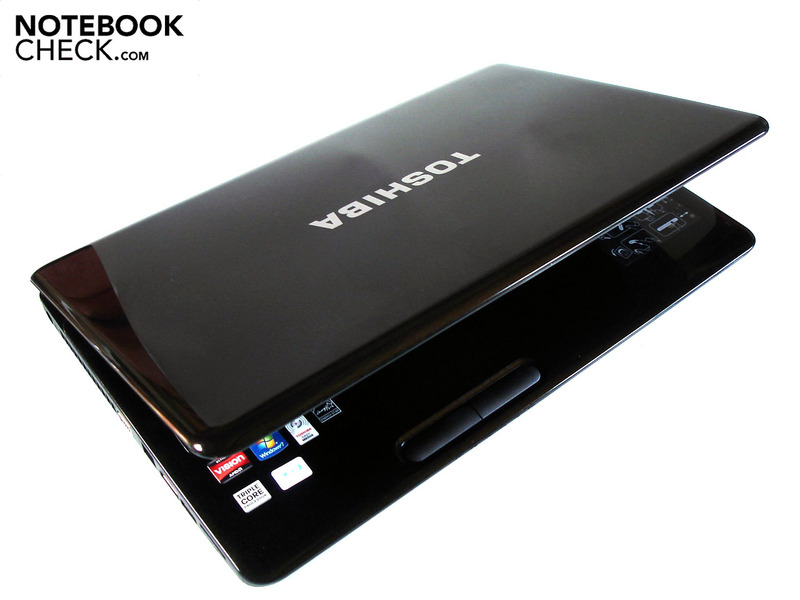 It is rare that one finds an integrated Blu-Ray burner on notebooks under 1000 Euro. The high-gloss chassis surfaces are very sensitive and become very dirty after a short time. The Phenom II X3 P820 can't hold a candle to Intel's current Core-i processors. Additionally, Toshiba clocked the Radeon HD 5650 at a disappointingly low frequency. 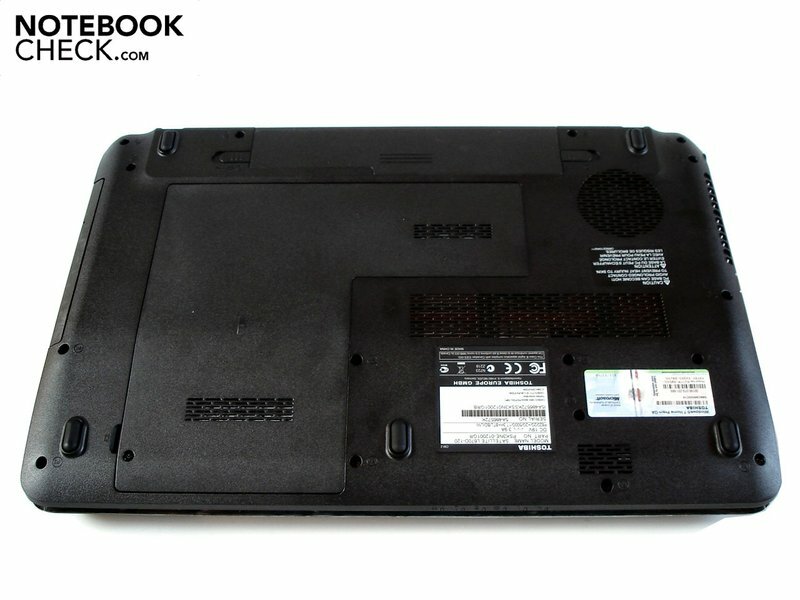 Other 17-inch multimedia/DTR- notebooks with good performance like the Samsung NP-R780-JS03DE, the Dell Studio 1749, the Acer Aspire 7745G-434G50Bn, the mySN MG7.c or the Dell Vosto 3700.